WTF President Chungwon Choue (left) shakes hands with TPF Chairman Sung-tae Kim after they inked the MOU at at the auditorium of the Taekwondowon in Muju, S. Korea on August 25, 2015. 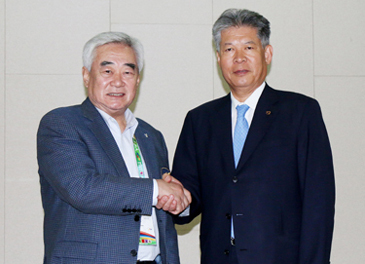 The MOU was inked between WTF President Chungwon Choue and TPF Chairman Sung-tae Kim at the auditorium of the Taekwondowon in Muju on the third day of the 2nd WTF World Cadet Taekwondo Championships. Under the pact, the two sides agreed to cooperate to use the Taekwondowon as a place for WTF-promoted various education and training programs. The signing was made in a ceremony shortly after WTF President Choue delivered a special lecture for TPF staff under the title of "Globalization of Taekwondo and Olympic Sport." The lecture, which lasted about 1 hour, drew about 100 people, most of them TPF staff.